July 12 to July 25 in the Special Promotions > Limited Time category in non-Reboot worlds only. July 12 to July 25 in the Special Promotions > Maple Rewards Shop category in both Reboot and non-Reboot worlds. Get your hands on totems, medals, pins, the Kimono Box (receive a random equip item with a 30-day duration), and the Sengoku School Bag (receive a random item such as effect coupons, chairs, scrolls, potions, and more). Click here to learn more about Sengoku High. July 12 to August 1 in the Special Promotions > New Arrivals category in both Reboot and non-Reboot worlds. July 12 to July 25 in the Special Promotions > Limited Time category in both Reboot and non-Reboot worlds. Do you need a fun chair for when you’re hanging out in Maple World? Use the Chair Gachapon Ticket, guaranteed to give you one amazing chair! And if you purchase it now, you can get it at a discount! Have some fun in the sun with the Shark N' Slide, Blue Beach Chair, Swing on the Persimmon Tree, Arboren Chair, and Korean Kite Slime. Pick your throne of choice with the Horntail Chair, Xerxes Chair, The Spirit of Rock Chair, Tiger Skin Chair, and Game of Seats Chair. Sit on something soft and fluffy like the Cocoa Sheep Chair, Rabbit Sofa, Blue Seal Cushion, Pink Seal Cushion, and White Seal Cushion. Get a little silly with the Regal Baby Stroller, Carousel Chair, Pudding Chair, and Chocolate Fondue Chair. If you and a friend both have the Chocolate Fondue Chair and sit near each other, an effect will appear! 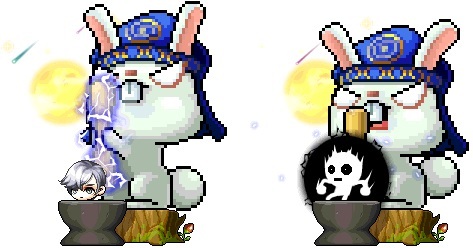 Get punished by the Electrifying Bunny Chair! On July 15 and 16, we will be having a special deal on Scissors of Karma and Platinum Scissors of Karma! You can use these items to make certain untradeable equipment tradeable one time. You have until 12:59 AM PDT / 3:59 AM EDT / 9:59 AM CEST / 5:59 PM AEST on July 17 to purchase these items at a discount! These items expire in 3 days, so be sure to move them to your item inventory to use as soon as you buy! July 12 to July 18 in the Special Promotions > Limited Time category in both Reboot and non-Reboot worlds. Channel your inner Hayato and Kanna! 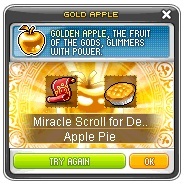 Dress up like a Sengoku with these permanent items. Put together a fun summer outfit and make a splash with these permanent items! July 5 to July 25 in the Special Promotions > New Arrivals category in both Reboot and non-Reboot worlds. Dinofrog, Kat's Magic Kit, Spring Fairy Fur Hat, Spring Fairy Outfit, Spring Fairy Flower, Spring Fairy Shoes, Nova Enchanter Hat, Nova Enchanter Clothes, Nova Enchanter Winged Cape, and Nova Enchanter Staff. July 5 to July 18 in the Appearance category in both Reboot and non-Reboot worlds. Check out the Male Hairstyles available now: Multi Hair (NEW! ), Short Cropped Hair (NEW! ), Time World White Rabbit Hair, Wanderer Boy, Windy Hair, and Eastern Mystery. Check out the Female Hairstyles available now: Kat Hair Mod (NEW! ), Super Cutie Hair (NEW! ), Time World Alice Hair, Yuri Hair, Laguna Beach, and Wavy Ponytail. Check out the Male Face Styles available now: Soft Smirk Face (NEW! ), Mischievous Face (NEW! ), Starlight Falling Face, Starry-Eyed Face, Bad Mood Look, and Android Face. Check out the Female Face Styles available now: Mischievous Face (NEW! ), Kat Ocular Mod (NEW! ), Starlight Falling Face, Yuri Face, Elegant Lady Face, and Pudding Face. July 5 to July 18 in the Special Promotions > Limited Time category in non-Reboot worlds only. Take home this adorable permanent Alpaca pet. It's like if a horse was cute and fluffy like a little bear! It's clearly the pinnacle of evolution! It comes with a Cloud Bag to wear, yummy pet food to eat, a Pet Name Tag, and some useful pet skills and scrolls. July 5 to July 18 in the Special Promotions > Limited Time category in Reboot world only. Let the adorable Alpaca pet join you on your adventures in Reboot World! Sengoku High is back from July 11 to 25! Are you ready? The summer of adventure continues with new areas Eluna and Arcana in the Override: Venture update!